The year was 1915. World War I had begun to take its terrible toll on the lives of Australians. The long ministry of Bishop Barlow had come to an end. The question arose: who would be the new Bishop who could speak clearly and publicly on the issue of war, as well as speak pastorally and wisely to those who were in the midst of its grief? On top of a public ministry, there was the need for a unifying leader within the Diocese – one who could honour all parts of this diverse diocese, minister to and with both clergy and laity alike, and have a broad outlook that led this broad church forward in the midst of crisis. A big task at hand. Surprisingly, only one name was put forward: Lewis Bostock Radford (born 5 June 1869). Lewis Radford was a university educated, English-born clergyman who was at the time the warden of St Paul’s College, Sydney. Radford was installed as Bishop at St Saviours Cathedral, Goulburn on 31 August 1915. But what was to be a glorious event was also a sad moment. Radford’s predecessor (Bishop Barlow) died the night before on August 30. So Radford’s Bishopric fittingly reflected the times – a time of both joy and pain. Bishop Radford threw himself into the life of Diocese. In the first four months he racked up approximately 7000kms by train, bus, hired-car and horse, confirmed 980 candidates, and didn’t take leave until 14 months later! It is a wonder he survived this time with any energy to burn. But energy Bishop Radford had. The next almost 20 years were a hive of activity, ably supported and enabled by a very competent Registrar, Ransome Wyatt (one of the best names our Diocese has ever been blessed to have). Under Radford’s leadership, the following was initiated: home missions, schools (a heritage that our Radford College is named after), a movement to increase the participation of laity in the life of the church, and the tireless work to keep our Diocese as one that is grounded in the Prayer Book. Throughout his Bishopric, Radford was primarily an intellectual, academic and administrator. This was vital for the time. But relationally, Bishop Radford was known to be contentious, cold, aloof and severe. His singleminded focus on issues such as the proposed Canberra Cathedral galvanised some, but alienated many. Radford was not widely liked, but he was deeply respected for being a public statesman in a time where a clear voice from the church was needed. 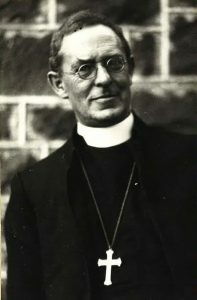 Bishop Radford served until his retirement on 31 December 1933. He died on 2 April 1937 in England. Touchingly, he requested his ashes to be returned to Australia, where they are now in the crypt under St John’s Church, Canberra. May our next Bishop be one who binds themself to us in a different but equally real way. NB. This is the third article in the series Know Your Bishop, which is not being published in order. Thank you Katherine! I shall make that adjustment!